Facebook sends by far the most mobile readers to news sites of any social media site, while Twitter mobile users spend more engaged time with news content, according to a new Pew Research Center analysis of audience behavior metrics from 30 news sites. This gap holds true for both longer and shorter news articles. Overall, our analysis of nearly 75,000 articles finds that mobile users spend more engaged time with long-form (1,000 words or more) than short-form (101-999 word) news stories – 123 seconds compared with 57 – and this gap holds true across all the different ways visitors arrive at news articles. The willingness of a mobile user to stay with a lengthier article on a small-screen device may have some implications for the future of long-form pieces and, in particular, the kind of long-form journalism that some publishers are investing in. While social media sites send the greatest amount of traffic to longer news stories (as well as shorter ones), the average engaged time from these readers is below that of other referral types like email links, links from within the same website and even search. However, a deeper look within the mix of social media sites reveals differences in the portion and engagement of their referrals. But mobile users arriving at these news stories from Twitter spend more time there than those from Facebook: an average of 133 seconds for longer content and 58 seconds for shorter content, compared with 107 seconds and 51 seconds respectively for those arriving from Facebook. Readers coming from Tumblr, meanwhile, spend the greatest amount of time on both the longer (150 seconds on average) and shorter (65 seconds) articles in this study, while those coming from Reddit fall roughly in the middle of the pack, averaging 103 seconds for longer articles and 55 seconds for shorter articles. 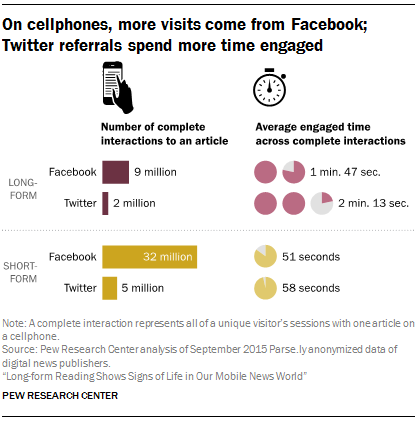 These differences in engaged time from social media referrals are another example of the unique ways users connect with news on each social media site. In other research, we have found that even though the same portions (63%) of Facebook and Twitter users get news on the sites, there are noteworthy differences between the two. Twitter users are about twice as likely as Facebook users to say they follow breaking news there (59% vs. 31%). And they are more likely than Facebook users to directly follow news organizations, reporters and commentators (46% vs. 28%). Twitter users also report regularly seeing news about four topics at higher rates than Facebook users: sports, business, international affairs and national government and politics. Research aimed specifically at connections to political news in social media suggests that, in contrast to our findings about engaged time with articles, Facebook users display greater engagement with each other and within the platform itself. About three-in-ten Facebook users (28%) comment on posts about government and politics and 43% “like” these Facebook posts. That compares with 13% of Twitter users who reply to tweets about government and politics and 17% who “favorite” them. What’s more, Facebook users are more likely to say they have learned about the presidential election in the past week on Facebook (52%) than Twitter users are to say they have learned about it on Twitter (43%). When it comes to how news from these social sites fits into one’s overall media diet, both Facebook and Twitter serve as important sources of news for a solid portion of users, but for each only a small core consider it the most important source. Four-in-ten Twitter and Facebook news users say their respective sites are an important way they get news, but only a small share describe them as the most important way they get news: 9% of Twitter news users and 4% of Facebook news users.